Why I went to his workshop? The workshop was great, well organised and managed to push through my limits. I did WHM at home but haven’t reached my limit until the day at the workshop. I believe doing it in a group and having that extra guidance definitely helped me to get to my edge. I experienced strong tingling in my body, euphoria and energy floating within. Since then, after a month of practising, I recall about 4-5 highly intense experiences while the others were more subtle. follow with push-ups (I started with 10, now do 25) but do as much as you can with no breathing! 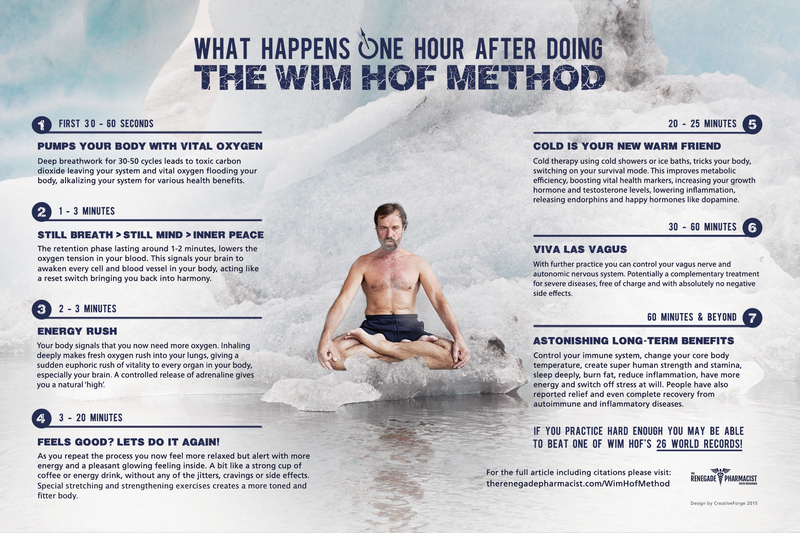 Below are some of the benefits listed on WHM brochures. The ones that I experience are highlighted bold. “MOTTO: HEALTHY HAPPY STRONG” – this is his motto he believes in and he also pointed out several issues that our society is facing and suggested to focus on these values to bring the better future. “MOTIVATION” – limit set and done – Kilimanjaro – 28 hours = incredible achievement. “CONTROL IMFLAMATION” – I practised breathing to fasten my recovery process and have achieved good results. Inflammation level was manageable and quickly gone. “CONTROL TEMPERATURE” – skin example 33 vs 31 in cold – normal – cold – normal changing environment (experiment at laboratory proved his skills). I believe it is a combination of will and mind control (potentially supported by breathing) to be mastered over a long-term practising. “COLD IS A TEACHER” – his favourite phrase and I would add, if COLD is a mind teacher, then CONCRETE is a bboys’ teacher :D.
“FIND the WAY to GO to your DEEPEST NATURE” – dig deep and push your limits. “BLOOD with protectors from COLD” had no reaction to bacteria – pretty cool! “PURSUE STILLNESS AND THEN THE OPPOSITE” – go from one extreme to another, so then anything above average becomes a piece of cake. “Fear of death” = you have to focus, find the clarity and win, the way he improved heavily (dive a day before official recording) he meant to do 42 strokes, but ended up doing extra 6+6+x extra until he found the hole to get out, fighting for his life. “Book: what doesn’t kill us” – amazon link I haven’t read it yet, on the to-do list. WHM => apparently better outcomes than NLP, visualisation and other. It’s early for me to judge. I consider WHM as a part of personal development and essential tool for improving our well being. I do see positive results and continue to study other breathing techniques further. I recommend WHM to others but please do your research first (before you try) – there are plenty of youtube videos and website links available.